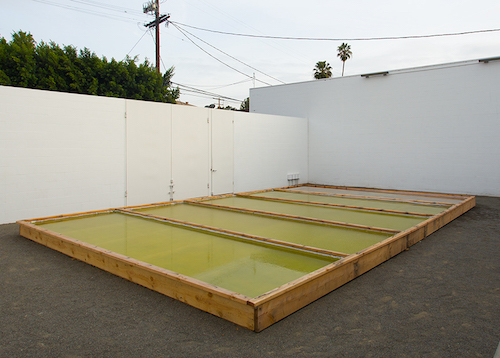 Newton and Helen Harrison, Notations of the Ecosystem of the Cargill Salt Works with the Inclusion of Brine Shrimp, 2017, Dunaliella algae, brine shrimp, saltwater, wood, plastic sheeting, 20' x 32' x 11". Also displayed is a delightful set of the duo’s working drawings. These describe plans for setting up food-producing ecosystems in art institutions using agricultural practices for which current enthusiasm is tempered. Hydroponic beans might be one thing, but farming seafood in small, contained tanks, which the artists’ did inside London’s Hayward Gallery in 1971, now seems awful. The Harrisons’ works are a message from the past about a possible version of the future. They call out our existing systems as inadequate but seem sustained by the belief that we can find creative solutions to the problems we’ve made for ourselves. The result is neither utopian nor dystopian, yet what is evident throughout is an approach that, though earnest, is entirely experimental and subtly reckless.